The recent national rallies to raise the minimum wage have made the Federal Theater Project’s 1936 Injunction Granted relevant all over again. 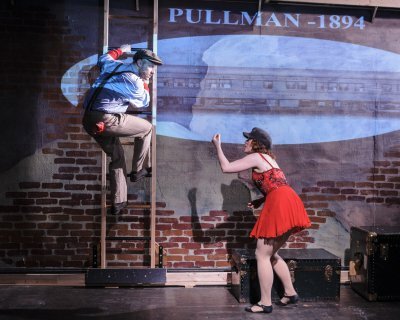 This play created by the Editorial Board of the Living Newspaper Unit of the FTP depicting the conflict of labor versus capital in the U.S. over almost 300 years turns out to be powerful theater in this revival by Metropolitan Playhouse. 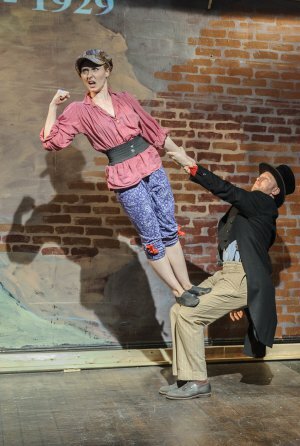 The third of the FTP Living Newspapers to be revived by this theater following One-Third of a Nation and Power, Alex Roe’s lively and inventive production uses six actors to play 200 characters in a vaudeville-like atmosphere. Performed in 28 short scenes and two parts, Injunction Granted follows the history of the struggle of unions against management from indentured servants leaving 17th century England for the 13 Colonies, and moving quickly to Bacon’s Rebellion in Virginia, 1676, all the way up to Depression Era U.S.A. in 1936 when the play received its premiere at Broadway’s Biltmore Theatre. With Roe himself acting as uncredited circus Master of Ceremonies and narrator, the five other actors are dressed as members of various theatrical professions: Nathaniel P. Claridad (magician), Lorinne Lampert (dancer), Cliff Miller (electrician), Kendall Rileigh (acrobat), and Perri Yaniv (accordionist). While some of the characters they play are still famous such as John D. Rockefeller and Samuel Gompers, many are names that have been lost to history. 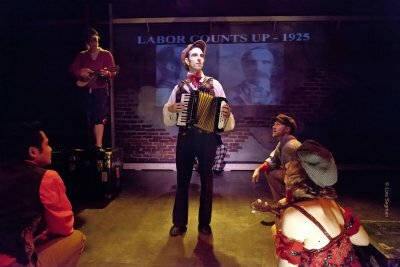 Wearing Rachael Kosch’s costumes in combinations on red, white and blue, the actors swiftly change pieces of their costumes as well as hats to represent factory owners, judges, miners, bakers, tycoons, union organizers, etc. The program also points out that hats defined social class (the top hat, the stove pipe, periwig, bowler, straw pork pie, fedora and caps) and the actors (each appearing in almost every scene) wear a great many to differentiate their many roles. The scenes are preceded by a slide projection giving the name and the date plus often making use of historic photographs, the effective work of Michael Hardart who also created the sound design. Siding with labor, the play is definitely agitprop but Roe’s vaudeville-style production is always entertaining and never pedantic, while the historical evidence piles up that the federal government and the American courts have usually sided with capital. The title “injunction granted” refers to the court orders that allowed employers to break strikes, stop picketing or suppress publications. 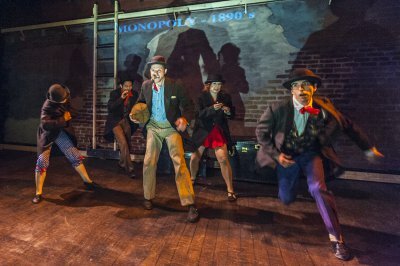 While the play depicts several well-known historical events (the Molly Maguires in 1875, the Pullman Strike in 1894, U.S. Steel in 1910), many of the events are just as startling but almost entirely forgotten today. However, the text drawn from 40 sources and credited to the “Editorial Board of the Living Newspaper” is most persuasive and still rousing after all these years. changes, as well as the acrobatics by Kendall Rileigh and the original music by Michael Kosch. While Injunction Granted has a decided leftist political view, the thorough research and the piling up of evidence make this a persuasive as well as entertaining historical panorama. Mildly amusing back stage comedy from 1920 gets a middling production as a drawing room comedy when it should be played as farce.